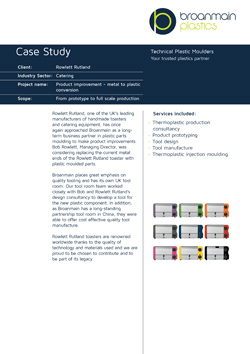 Rowlett Rutland, one of the UK’s leading manufacturers of handmade toasters and catering equipment, has once again approached Broanmain, as a long-term business partner in plastic parts moulding to make product improvements. Bob Rowlett, Managing Director, was considering metal to plastic conversion of the products’ current metal ends with plastic moulded parts. Broanmain places great emphasis on quality tooling and has its own UK tool room. Our tool room team worked closely with Bob and Rowlett Rutland’s design consultancy to develop a tool for the new plastic component. In addition, as Broanmain has a long-standing partnership tool room in China, they were able to offer cost effective quality tool manufacture. 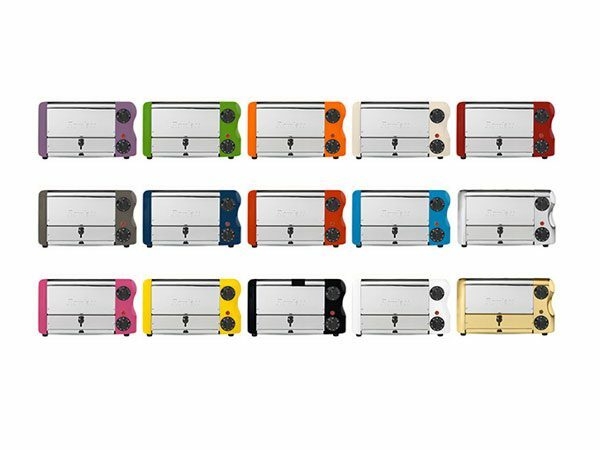 Rowlett Rutland toasters are renowned worldwide thanks to the quality of technology and materials used and we are proud to be chosen to contribute and to be part of its legacy.